Detecting the progression from amnestic mild cognitive impairment (aMCI) to Alzheimer’s dementia remains a key research area; particularly when recruiting the right patients into clinical trials. A cognitive function which is compromised early in the development of Alzheimer’s disease, more than six years prior diagnosis in fact, is episodic memory. A reliable assessment of episodic memory is the CANTAB Paired Associate Learning (PAL) task. Indeed, this test has shown to be sensitive to different stages of disease progression, to drug effects and to different biomarkers of Alzheimer’s disease. To explore whether baseline performance on CANTAB tests, including PAL, can predict which patients with aMCI will show declines in their functional abilities, over the course of two years. When recruited, the patients all showed subjective memory complaints: a Mini-mental State Examination score ≥24 and Clinical Dementia Rating score of 0.5. The CANTAB cognitive test battery and the Functional Activities Questionnaire (FAQ) were administered throughout the study follow-up (24 months). Cerebrospinal Fluid (CSF) samples were also collected, and levels of Amyloid-β 42, phosphorylated tau 181 (p-tau) and tau proteins were measured. 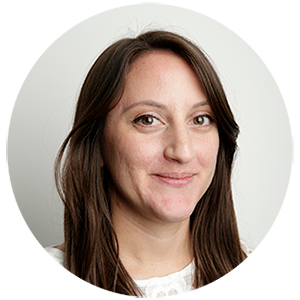 For the analysis, prediction models were developed to classify individuals by change in FAQ. ​Figure 1 illustrates how tthe participants with the fastest decline on FAQ have the poorest performance on the CANTAB episodic memory Task PAL (PALTEA) over 24 months, supporting the ability to predict decliners using CANTAB task performance. Figure 1. 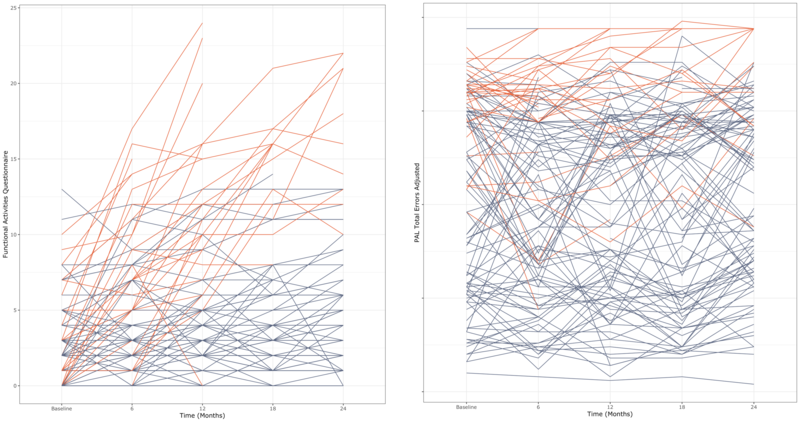 Participant-level trajectories over 24 months in the PharmaCog study for performance on Functional Activities Questionnaire and CANTAB Paired Associates Learning (Total Errors Adjusted (PALTEA). The orange colour highlights the participants showing the most rapid decline in functional activity performance. Whilst the group with greatest decline in FAQ was enriched for individuals with both low levels of CSF amyloid and Alzheimer’s disease diagnosis at last follow-up; 31% of individuals within the non-declining group had low CSF amyloid levels, consistent with remaining at the mild cognitively impaired stage. Taken together these results suggest that scores on CANTAB PAL and SWM correlate with future functional deterioration, providing useful screening information when recruiting into Alzheimer’s trials. 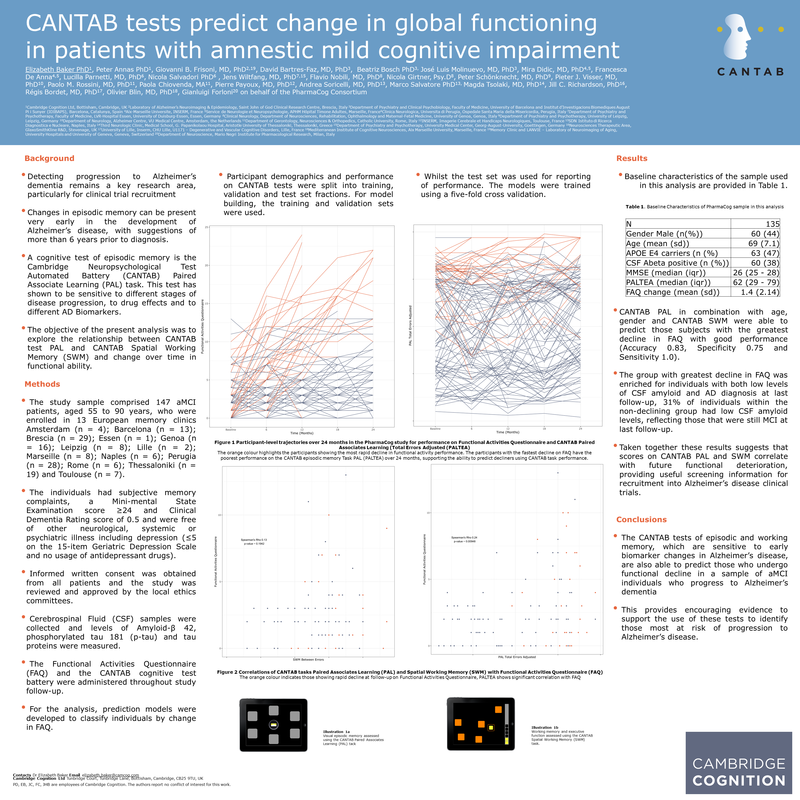 Baseline performance on CANTAB tests of episodic and working memory can predict who in a sample of aMCI individuals will develop functional deficits, consistent with an Alzheimer’s dementia diagnosis, over the course of two years.